Star Wars: Galaxy’s Edge isn’t set to open until 2019 at Disneyland and Disney’s Hollywood Studios, but Disney has given fans a sneak peek at merchandise that is available now for the new land. 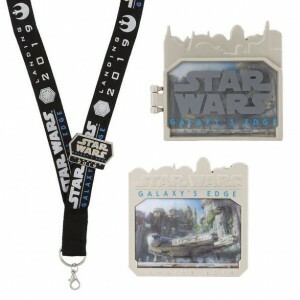 The new merchandise items were unveiled at the Star Wars Galactic Nights event earlier this month at Disney’s Hollywood Studios. Items include men’s and women’s tees, hats, and other apparel; artwork featuring artist renderings of the new land; a coffee tumbler; pins; and more. Guests can purchase these items at select merchandise locations at Disneyland and Disney World.